Canary yellow flowers cover erect 3′ spikes from June through October. 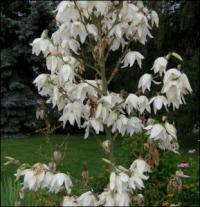 Care: Sun in moist well-drained to well-drained soil - self-seeder. Cut flower stalk off to prevent reseeding & for reblooming. Drought tolerant. 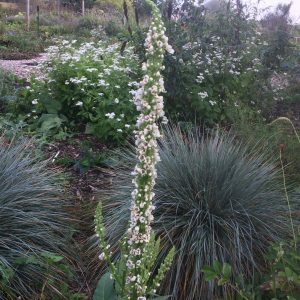 Six foot tall stalks bearing alabaster bells tower over clumps of swordlike leaves with margins of curly threads in July and August. Wildlife Value: It’s only pollinator is the Yucca moth and the Yucca is the only food source for the Yucca moth in a mutually beneficial relationship. Awards: England's Royal Horticultural Society Award of Garden Merit; Cary Award Distinctive Plants for New England and Elisabeth Carey Miller Botanical Garden Great Plant Pick.